As San Francisco public spaces have come to life with the surge of street food, markets and community events. The Mission District does not have a central plaza to support these activities. We believe it should. At 30% of recommend open space, the Mission District lacks safe, accessible public areas for diverse neighbors, businesses and community organizations to come together. We are seeking to bring all the diverse people in our community together, which is why we lead the effort to create a new plaza for the Mission in 2016! Through healthy foods, local business and community events, we are turning public space into common ground. In 2014, Mission District youth completed the Mission Community Assessment & Youth Engagement Project thanks to the generous support of the San Francisco Foundation and Clif Bar Foundation. 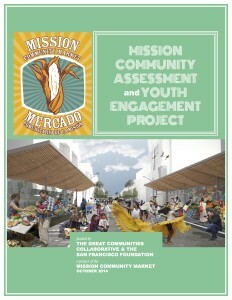 Their final report assessed the activities and designs Mission residents needed the most to connect with their community. 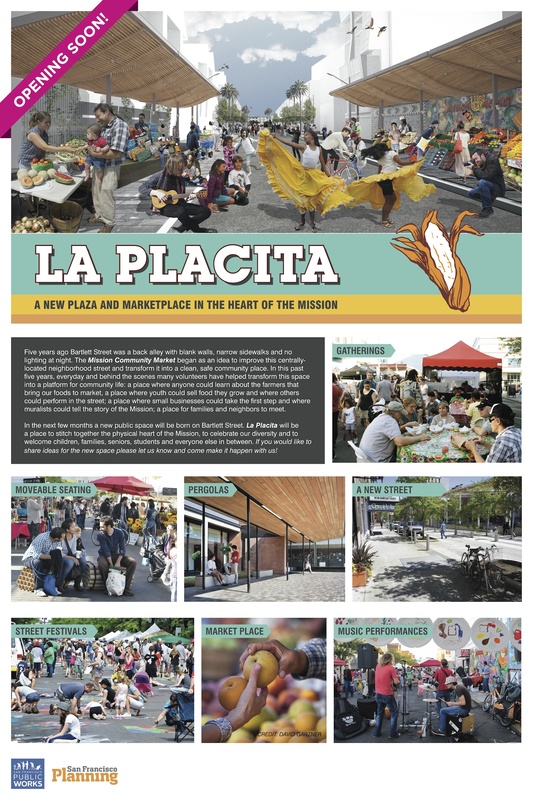 Your donation directly supports the activation and programming of the new “Placita,” (formerly Mercado Plaza) which seeks to fulfill the needs identified in the Youth Assessment with community festivals, live music, games and events for non-profits throughout the Mission. In particular, your donations go towards creating a new weekend event and a long-term maintenance plan to keep the Placita safe, full of public art and serving of the community. Email us if you’d like to participate or help develop new, exciting activities for La Placita.